When computer engineer Joel Jackson arrived in Kenya in 2009 one of the first things he noticed was the state of the roads. He had come to the country with a non-profit organisation to help small-scale farmers increase their productivity, but he soon realised that a more pressing problem existed. "It became clear that the lack of appropriate transport affected many parts of rural Africa," he said. So he set about building something that would fill that gap - a $6,000 (£3,850) car. Mobius One, as the first vehicle was dubbed, was built by local welders and mechanics. The car was stripped of all the luxuries that Western drivers take for granted. "It had a tubular steel frame and off-the-shelf parts. It looked like a dune buggy, took 10 months to build and cost $14,000 (£9,000)," said Mr Jackson. But it worked, and that was enough to persuade him to quit his day job and move full-time to his newly formed company, Mobius Motors. He raised a quarter of a million dollars in venture-capital funding and used some of it to recruit a team of engineers to build the second prototype, Mobius Two. "We eliminated all non-essential features. The important thing was to make sure it was rugged and durable because African roads are highly degraded," he said. The car, completed in September 2011, had far more detailed engineering and design. It cost $15,000 and took three months to build. Image caption Joel Jackson hopes to provide "the car for Africa"
"We drove it around Kenya and it performed well. When we drove it through Nairobi people routinely came up and asked where they could get one," he said. For Mr Jackson the ability to buy a new car designed specifically for the African market will appeal to the growing African middle classes. He aims for the finished vehicle to be sold for $6,000, which, he said, is cheaper than many Kenyans pay for a second-hand car - a four-year-old Toyota, for example, sells for around $8,000. Second-hand cars in Kenya are expensive because customs, excise and VAT add a huge amount to the price tag. 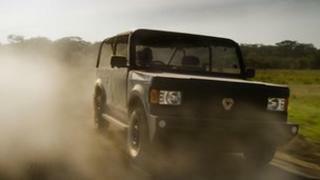 "A brand new off-road vehicle will cost around $60,000," said Mr Jackson. There are currently around 800,000 cars in Kenya, with around 80,000 sold each year. The vast majority of these are second-hand and many are bought to sustain a business rather than for personal use. "People cram around 12 people into a car and run an informal public transport route," Mr Jackson told the BBC. A car designed specifically for off-roading could be "an asset to run a business with", he added. "Mobius has the chance to change the transport network in Africa. Access to transportation means access to education and health services and that is the social impact of the project," he added. "My ambition is for this to be the car for Africa and I'd like to see hundreds of thousands of them produced each year," he said. So far he has 15 pre-orders with another 100 in the pipeline. The production run this year will be modest, at around 50, but he hopes to scale that up to 400,000 a year in the next decade.